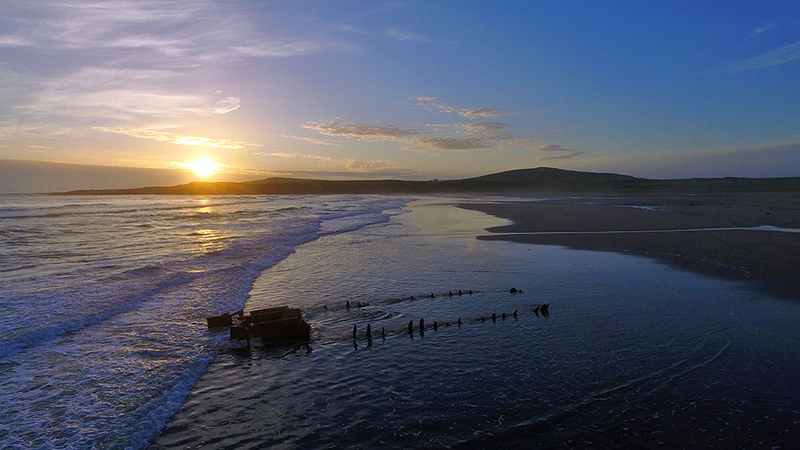 A June sunset in Machir Bay on the west coast of Islay, seen from the air with a DJI Phantom 3 Professional quadcopter. The Sun is setting behind Coull Point while waving are running up the beach around the wreck of the Patti. This entry was posted in Beaches, Cloudy Weather, Islay from the air, Landscape, New Post, Sunny Weather, Sunset and tagged Coull, Islay, Kilchoman, Machir Bay, Rhinns of Islay, wreck by Armin Grewe. Bookmark the permalink.